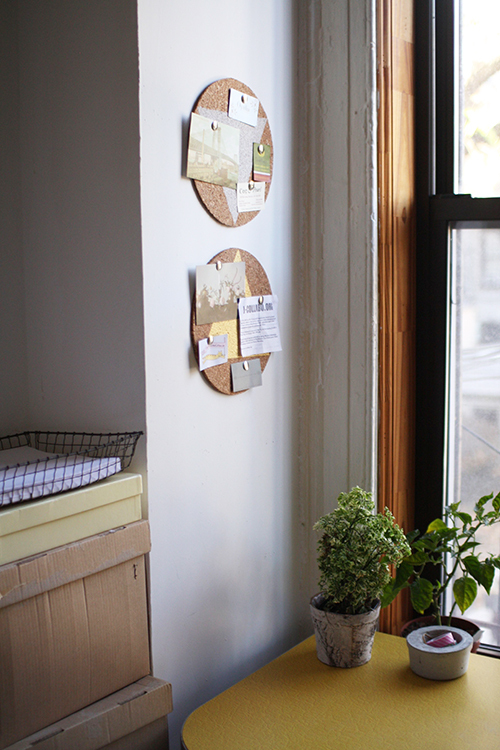 We have a little desk by the window in our spare room, which is where I like to do most of my crafty stuff, and I wanted some sort of pin-up board above it so I could look up and instantly feel inspired. With limited space, these two small circles were the perfect solution! 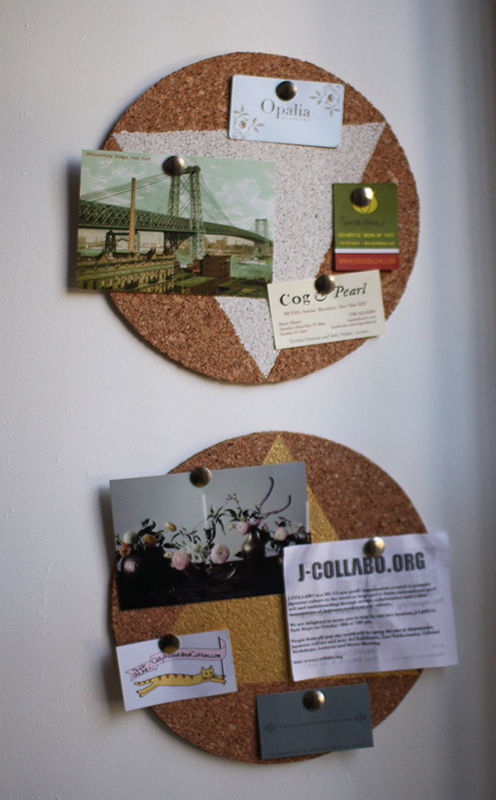 cork board (I bought two squares from our local Utrecht (a brilliant art supplies store here in the US) but you could use one large sheet. Check out hardware stores and craft shops. 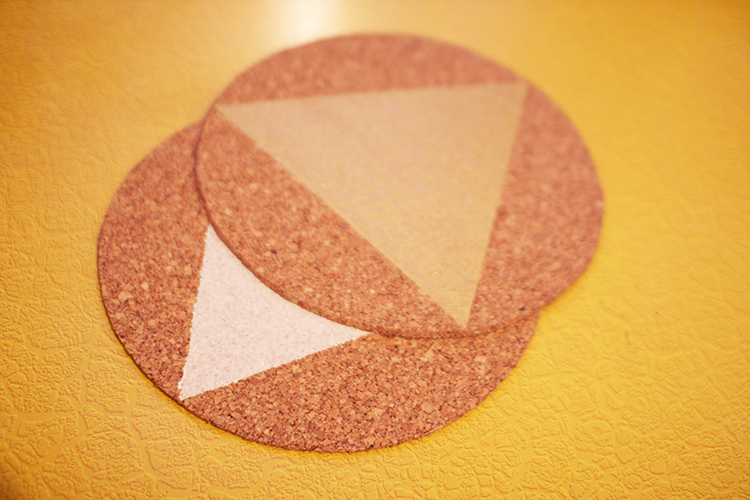 Place your plate face-down on your cork and trace around it with a pencil. Do this twice if you want to make two boards like mine. 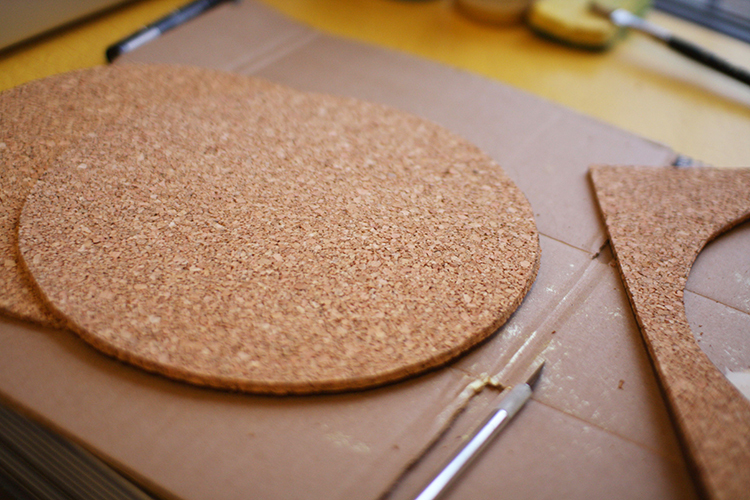 Cut your boards out of the cork using scissors or a craft knife. Use your ruler to find the middle point at the top of your circle. 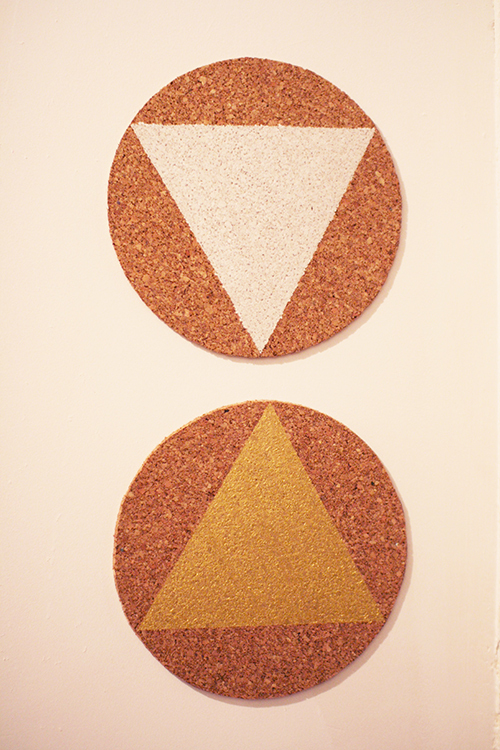 Using this as the top point, use masking tape to mark out a triangle on your cork. Make sure the triangle space in the middle is even and that all your points come all the way to the edge. 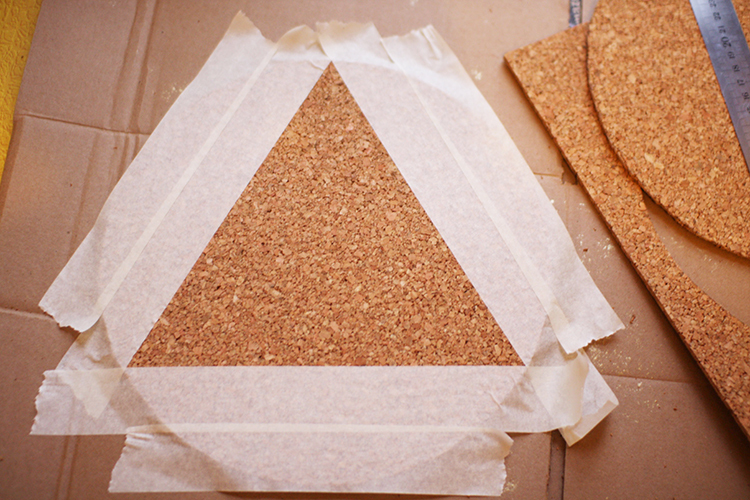 If you’re using spray paint add extra masking tape to cover all areas of the cork other than the triangle. Apply your paint. I did one triangle in gold and one in white because that was what I had lying around, but you could use whatever colours you like. I just used ordinary acrylic paint applied with a paintbrush but you could also apply it with a mini roller to get a nice even finish, or you could use spray paint. 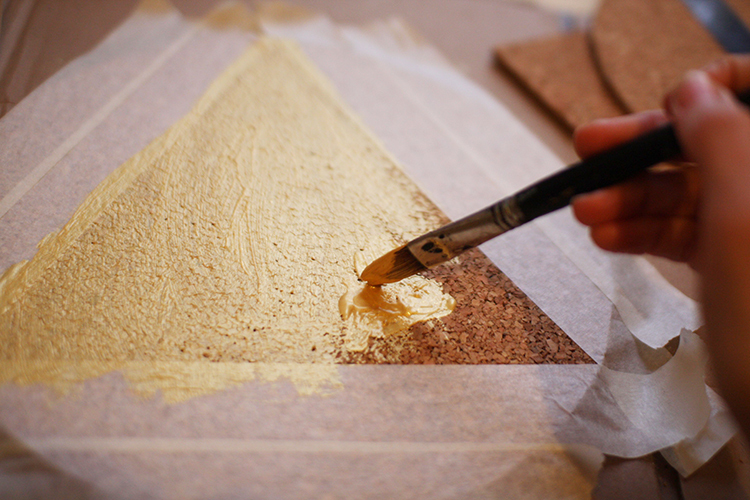 Leave it to dry and then remove your masking tape to reveal your triangles! 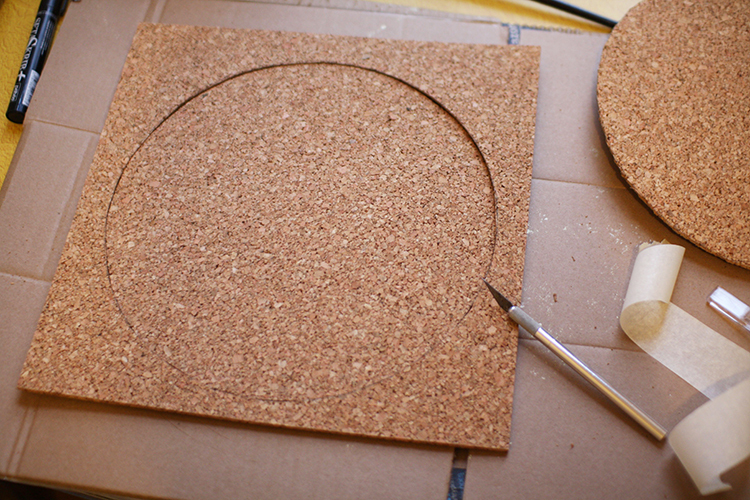 Wall mount your cork circles and start pinning away! 04 Dec	This entry was published on December 4, 2013 at 2:24 am. It’s filed under make and tagged DIY, home, ideas, inspiration board, make. Bookmark the permalink. Follow any comments here with the RSS feed for this post.